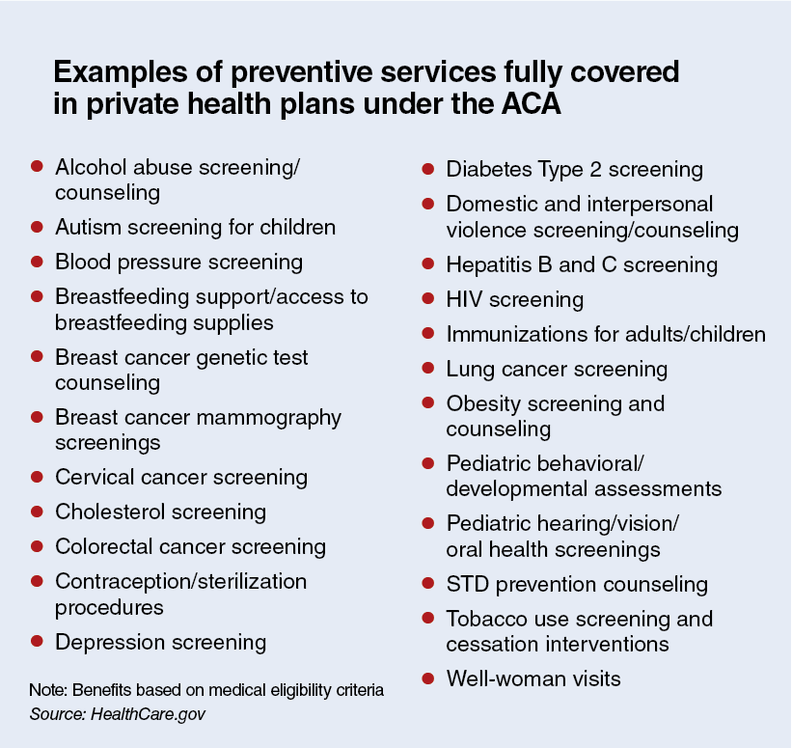 The Affordable Care Act extended 100% coverage for a range of preventive healthcare services, including some types of cancer screening, to seniors on Medicare. That first-dollar coverage likely saved lives by increasing diagnoses of early-stage colorectal cancer by 8% among Medicare beneficiaries during the first three years it was in effect, a new study in Health Affairs reported. Now experts fear Republicans will eliminate the law's mandate for full coverage of recommended preventive services in taxpayer-financed and employer-based health plans. The GOP proposals also would erase the requirement that individual plans offer minimum essential benefits in 10 categories, including mental health and substance abuse, maternity care and prescription drugs. Even without a replacement plan, some predict the Trump administration may move quickly to ease coverage rules. The president's recent executive order instructed federal agencies to roll back the ACA. GOP proposals, including those released by House Speaker Paul Ryan and HHS secretary-nominee Dr. Tom Price, would encourage insurers to offer cheaper, high-deductible plans by eliminating various ACA mandates, including coverage of preventive services. The theory is that consumers could funnel savings from lower premiums into tax-sheltered health savings accounts to pay for voluntarily purchased cancer screening and other preventive services. ACA repeal puts free cancer screenings and prevention benefits for seniors and many privately insured patients at risk, although it might take a prolonged rulemaking process to make it happen. Without a benefit mandate, private insurers would be free to limit prevention coverage to plans with higher premiums, said J.B. Silvers, a professor of healthcare finance at Case Western Reserve University and former health plan CEO. Healthcare providers and patient advocacy groups fear that would lead many patients of modest means to skip cancer screenings and other preventive services, as many did in pre-ACA days. A post-election survey of primary-care physicians published in the New England Journal of Medicine found that only 29% supported expanding the use of high-deductible plans. “When you put in cost barriers, especially for colorectal cancer screening, there's a lot of reluctance among patients to get the screening,” said Caroline Powers, director of federal relations for the American Cancer Society's Cancer Action Network. She noted that a colonoscopy could cost patients up to $1,000 out of pocket without the first-dollar coverage mandate. She and other experts doubt that HSAs would make much difference. “Patients with chronic illnesses become very wary about spending their scarce dollars on prevention,” said Dr. Cary Gross, an internist and professor at the Yale School of Medicine. Some conservatives and insurers hope the Trump administration will pare down the ACA's required benefits in time to reduce premiums for individual-market plans sold for 2018. But that probably can't be done through swift administrative action, experts say. Congress prescribed the essential benefits package in the ACA, which was implemented through formal rule-making. Usually, it takes another rule to repeal a rule, which can take months. Conservative legal scholars are hoping the Congressional Review Act may provide a loophole for skirting that process. Insurers need to know the new benefits rules before filing their proposed 2018 ACA plan offerings and rates this spring. So the earliest the administration likely could implement slimmed-down benefits requirements would be for the 2019 plan year. Republicans are hoping to pass a full legislative package to replace the ACA long before then. “If one were trying to get rid of the minimum essential benefits, it wouldn't make sense to try to change them two years from now,” said Dania Palanker, a health policy expert at Georgetown University. The Trump administration may have an easier time rolling back women's services, particular contraception. That's because those first-dollar benefits were established through guidelines updated in December by the Health Resources and Services Administration, based on recommendations from a medical task force. They include all 18 Food and Drug Administration-approved forms of contraception; breast cancer screening and follow-up testing; breast feeding support and supplies; and testing for the human papillomavirus. The ACA's contraception coverage has been repeatedly challenged by religious conservatives. Price recently said at his confirmation hearing that “women (should) be able to purchase the kind of contraception they desire.” Delisting birth control as a covered service may not require going through formal rule-making, Palanker said. The AEI's Miller questions the value of many preventive services, and thinks they should be deregulated. But he also worries about turning back those decisions to the states, where provider and patient groups have leverage. “Politics at the state level has tended to increase those required benefits,” he noted.